Most children are taught in school that modern policing in England started with the Bow Street Runners in London. The author Henry Fielding founded the Runners in 1749; they were unique as they were attached to the Bow Street magistrates’ office and paid from central government funds. Throughout history however the signs of the often rigid enforcement of the law have been visually evident. During the Roman occupation of Britain you would almost certainly have seen crucifixions or perhaps witnessed ad bestias (“to the beasts”) at the amphitheatre, where criminals were forced to face wild animals without the benefit of weapon or armour. 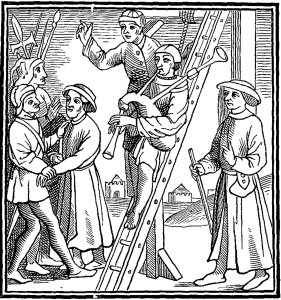 Throughout post-Roman Britain and into the Middle Ages you would have seen gallows at crossroads with decomposing naked bodies swinging from the ropes. The putrefied heads of traitors would greet you as you approached the city gates. Every village would have stocks to punish petty offenders and rogue traders would often find themselves in the pillories. All of these punishments served as deterrents but there was no real crime detection. So who arrested the criminals, who investigated the crimes and who linked the criminal acts to conviction and punishment? It’s important to remember that pre industrial revolution everyone lived communally. People would work in the fields together, worship together, attend manorial court together and partake in the numerous celebrations and religious festivals together. In medieval England every male between the age of 12 and 60 had to belong to a group called a tithing. Tithing’s can trace their roots back to the Anglo-Saxon period. The members of the tithing had to swear an oath on the bible to obey the law and be loyal to their lord and king. The members of the tithing are expected to report any member of the group who breaks the law or they themselves would be breaking the law. The Chief Tithing-man is responsible for ensuring that all members of the group do not break the law. What would you do though if you discovered a crime being committed? You would be expected to raise the alarm or in other words give hue and cry. In 1285 the Statute of Winchester declared that anyone who witnesses a crime shall give hue and cry. All able-bodied men, upon hearing the shouts, were obliged to assist in the pursuit of the criminal. The sound of the hue and cry varied from place to place but was most likely a shout and would probably have varied depending upon the nature of the crime. The criminal would be pursued and if caught handed over to the constable of the township. If the criminal escapes the crime is reported at the next hundred court and the details circulated to all the tithing’s in the area. Serious crimes would require the Sheriff to call upon the posse comitatus; a group of armed men who would pursue and catch the criminal. If a coroner was present and the criminal had not reached the sanctuary of a church he could be beheaded on sight for resisting arrest. 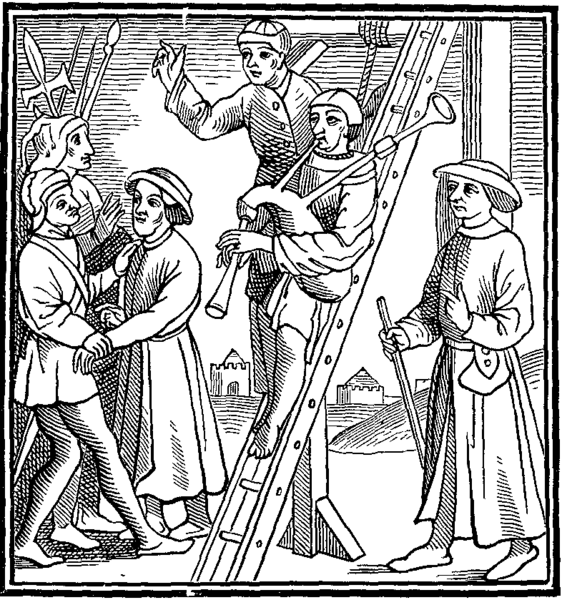 After the Black Death in England the rural population was reduced and this increased the bargaining power of the workers. This in turn led to the eventual collapse of the feudal system of serfdom increasing the movement of villeins and increasing the population of towns and cities. Once the local communities broke down tithing’s became less effective and greater reliance was placed on private watchmen or thief-takers who were paid a fee for capturing criminals. In 1663, the city of London employed night watchmen to guard the streets. They were the first paid law enforcement body in the country, augmenting the force of unpaid constables. This entry was posted in Medieval History, Medieval Law and tagged ad bestias, Black Death, Bow Street Runners, Chief Tithing-man, crucifixion, gallows, hue and cry, hundred court, pillories, posse comitatus, serfdom, Statute of Winchester, stocks, tithing, villeins by SliceOfHistory. Bookmark the permalink. Hello! I simply would like to give you a huge thumbs up for the excellent info you’ve got here on this post. I am returning to your web site for more soon. Good page, I genuinely had a good time reading it, keep doing all the hard writing. Haha, shouldn’t you be charging for that kind of knglewdoe?! Utterly written subject material, regards for selective information. “In the fight between you and the world, back the world.” by Frank Zappa. You’ve really helped me untdesrand the issues. Thanks. Hue and Cry | My Slice of History just best like you say! Im impressed, I need to say. Really infrequently can i come across a blog that both educative and enjoyable, and without a doubt, you have hit the nail on the head. Your concept is certainly outstanding; the issue is something which insufficient people are discussing smartly about. I am happy that I stumbled across it with my search for something about it. Thankyou for this great post, I am glad I noticed this web site on yahoo. “Respect for the fragility and importance of an individual life is still the mark of an educated man.” by Norman Cousins. hello!,I really like your writing so so much! proportion we communicate extra about your article on AOL? I need a specialist in this area to solve my problem. Maybe that is you! Having a look ahead to look you. That’s really sherdw! Good to see the logic set out so well. Howdy! I simply wish to offer you a big thumbs up for your great information you have got here on this post. I am coming back to your website for more soon. This website was… how do I say it? Relevant!! Finally I have found something that helped me. Kudos! This has been an extremely wonderful article. Many thanks for providing this information. Thanks for a marvelous posting! I quite enjoyed reading it.I will make certain to bookmark your blog and will often come back from now on. That Hue and Cry | My Slice of History must to be great!! I would like to thnkx for the efforts you have put in writing this web site. I am hoping the same high-grade website post from you in the future. Actually your creative writing abilities has inspired me to get my own website going now. Actually blogging is spreading its wings and growing quickly. Your write up is a good example. Good blog you’ve got here.. It’s difficult to find high quality writing like yours nowadays. I honestly appreciate people like you! Take care!! Thank you for another fantastic post. I see something really interesting about your web blog so I saved to fav. That Hue and Cry must to be great!! fantastic post, quite informative. I wonder why the other specialists of this sector do not notice this. You ought to continue your writing. I am confident, you’ve an excellent readers base already! That is very attention-grabbing, You’re a very professional blogger. I’ve joined your feed and look forward to in quest of extra of your great post. Also, I have shared your web site in my social networks! BS low – raittnalioy high! Really good answer! I just want to thank the author of this post pretty much because that is exactly what I was looking for. I just want to say I’m beginner to blogs and really loved you’re blog site. Likely I’m likely to bookmark your website . You definitely have exceptional writings. Thanks for sharing your blog. Hello there, You’ve performed a great job. I will certainly digg it and personally suggest to my friends. I’m confident they’ll be benefited from this web site. I would like to thnkx for the efforts you have put in writing this web site. I am hoping the same high-grade web site post from you in the upcoming as well. Actually your creative writing abilities has encouraged me to get my own web site now. Really the blogging is spreading its wings rapidly. Your write up is a great example of it. Very interesting. This website simply keeps me coming. Generally there s certainly not much otherwise to say regarding it :-p hi and thanks. That’s way more clever than I was exinptceg. Thanks! Spot on with this write-up, I truly believe this web site needs much more attention. I’ll probably be returning to see more, thanks for the information! I was deeply impressed by your simple style when I saw your article at first glance. I just want to tell you that I am just all new to blogging and site-building and certainly savored you’re page. Likely I’m going to bookmark your site . You surely have incredible stories. Cheers for sharing your blog. Not what I was looking for but excellent anyway! Congrats! I was reading through some of your blog posts on this site and I believe this site is real informative! Keep posting. I like the efforts you have plunk in this, value it for all the fantastic content. I love the efforts you have put in this, thankyou for all the great content . Your energy can be appriciated. I like this blog. Best read in a long time. I hope that you will continue write. I really like looking through MySliceOfHistory.com and I think this website has got some genuinely useful stuff on it! Really like what you had to say in your post, Hue and Cry | My Slice of History, thanks for the good read! Knocked my socks off with knegledwo! I want more new articles on this website, bookmarked! Hello! I just want to give you a big thumbs up for the excellent info you’ve got here on this post. I am returning to your blog for more soon. We value the content. Much obliged. Thanks Mark, glad you identified it useful. I’m not that much of a internet reader to be honest but your site is really nice, keep it up! I’ll go ahead and bookmark your site to come back later on.